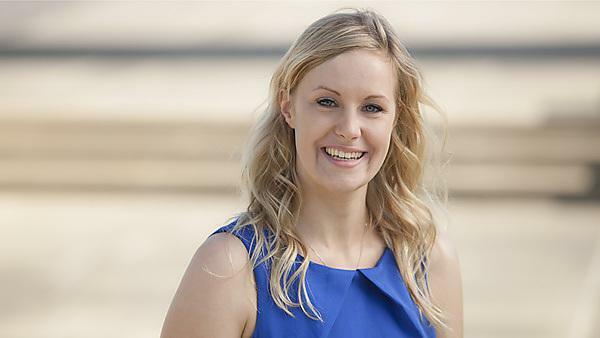 Through the help of on-campus services, such as Jobshop, Lucy Gibbs found her ideal graduate job in her ideal location. The interesting thing about my career path is that it began before I actually graduated. I finished my exams in May, but I had been applying for jobs since March with the help of Jobshop, the University recruitment service, which meant that I was offered my job in June before my graduation ceremony. If you want to hit the ground running with your career when you finish university, it pays to start looking early. I really enjoyed my time in Plymouth and so I was really keen to find a job where I could keep living in the South West. This narrowed down my options when looking for jobs and meant that I had to be on the ball when keeping my eyes peeled for potential opportunities. I now work for the Innovation Team at Sponge UK who deal with clients from all over the globe, and since we are based in Plymouth this means a lot of travel is involved. I have had many trips to London, Europe, and even America, which is an exciting part of the role. I am really pleased with my time at University. I had amazing support from my tutor and dissertation advisor, which meant that I could ask for help whenever I needed it. I think the only thing I would do differently is join more clubs and societies while they were available to me because you miss them when they are gone. I fell in love with the city from the moment I moved in. Everything I needed was within walking distance and I could go to the beach, study, go shopping or go for a walk on the Moors all in the same county. But I also enjoyed studying in an up-and-coming university which really supported their students in all aspects of life. If you want to start thinking about your career, I would really advise that you use the services which the University provides. Jobshop were really helpful at getting me to search in the right places, getting my LinkedIn page in order, and helping me with my CV.